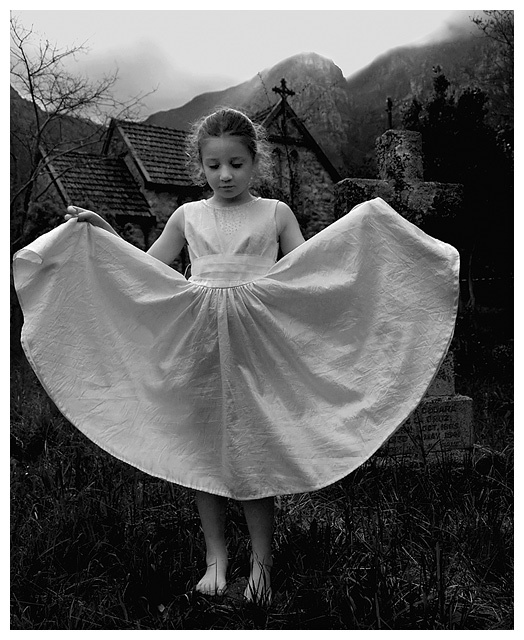 My Lily - again - in an old Flower Girl dress: have to admit that this week's challenges sort of merged into one for me: Wings, Backlit, Sacred: I just couldn't get ideas about churches, angels in stone and graveyards out of my head!! I really went to this churchyard looking for a majestic gravestone angel for Lily to stand in front of, so that the wings of the angel became hers...but no angels at this churchyard and while we were thinking of shots for "Sacred" or backlit...she did this and Woah I saw WINGS.... Love the result...and it's yet another for the family portrait wall. Yes, what posthumous says, but also the composition with all the echoing diagonals, and I suspect it is the light and dark treatment(?) that puts this into the realm of wonder and imagination. Wings. Thanks for the incredible comments - this was a fun ride. Was happy with the finish result. Love the feel of this shot and the post processing. I'd love to know your steps. I would have liked to seen a little more space on her right though. Scotland? An incredibly appealing image. The contrast is beautiful - great black and white. Love the gothic feel of the pic. A gorgeous black & white. I love the mood. 10. Subtle yet strong enough to be meaningful. So very sweet and a very nice black and white. I like very much the halos around her head and the mountains. This is a masterpiece. Something stopped me from voting this a 2 or 3 along with the rest of the 'children looking cute' shots. Along with the rest of the sentimental 'children as angels' shots. Perhaps its the simplicity of it, perhaps simply the black and white, and perhaps the sinister, catholic, threatening duplication of those ancient crosses above and behind her. As if to suggest that for all this posing in churchyards stuff, there yet might be a re-rising of an old testament God who would not look favourably on such playing in his serious environments. That, coupled with a sense of humility in this child, make for an intriguing narrative that I couldn't quite ignore. I'm not one for the posed photograph, but the implications of this appeal to the Calvinist element of my soul, and I can't ignore that, can I? Wow, very interesting image love how dark it is, 10. Cute girl. Like the black and white. excellent, very professional. my choice for the blue ribbon. I love the b/w and the take on the challenge! I was going to use a dress too! Great job. I'm not sure how this is going to do, I personally like this shot, especially the black & white. But some DPCers may be looking for the actual wing shots. I love the background, I understand the dress represents wings...but it's stretching the challenge a bit. I rather like the figurative wings here. Not the obvious feathered ones. The composition is lovely and the lighting and tones are great. Proudly hosted by Sargasso Networks. Current Server Time: 04/25/2019 08:38:51 AM EDT.